When the puck drops tonight in Brooklyn at Barclays Center, it’ll kick off a new era of Islanders hockey. No longer are they on Long Island. Sadly, their rich history came to an end with the final game at Nassau Coliseum played on April 25, 2015. 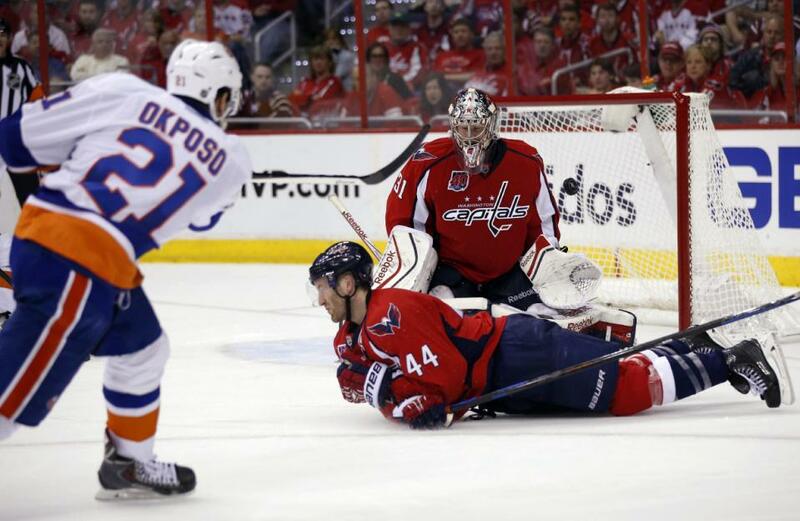 They won Game 6 of the first round 3-1 over the Capitals with captain John Tavares scoring one of the three goals. The Caps ended their season. None of that means a thing when curtain drops on Barclays Center. The Islanders play host to the defending champion Blackhawks in the game of the night. All the stars will be out in downtown Brooklyn to see Tavares and Co. do battle against Jonathan Toews and booing target Patrick Kane. A third place team a year ago after a great start, the Isles return almost everyone including forwards Josh Bailey, Nikolay Kulemin, Mikhail Grabovski, Casey Cizikas, Cal Clutterbuck, Anders Lee, Matt Martin, Brock Nelson, Frans Nielsen, Kyle Okposo, Ryan Strome, Tavares plus defensemen Johnny Boychuk, Calvin de Haan, Travis Hamonic, Nick Leddy, Brian Strait and Thomas Hickey. GM Garth Snow added new faces Steve Bernier and Marek Zidlicky along with Thomas Greiss, who’ll backup starter Jaroslav Halak. The only real subtraction was Michael Grabner who was expendable due to the Isles’ scoring depth and entering the final year of a contract that pays him $5 million. He’s now a Maple Leaf. 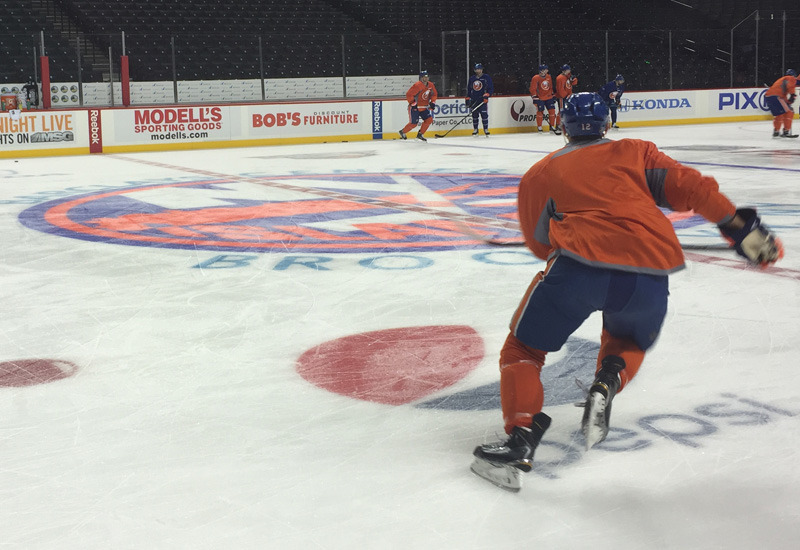 Islanders coach Jack Capuano has plenty of options for smart penalty killing forwards. The gritty Bernier could be one when he plays. He’ll fit in well. What makes the Isles so tough is they have four lines who can fore check and take the body. They also boast young talent in Strome, Lee and Nelson who all are capable of improving. Strome broke out with 17 goals and 50 points while Lee posted 25 goals in his rookie season. Nelson started hot achieving career bests in goals (20), assists (22) and points (42). Kyle Okposo beats Phillip Grubauer for a goal in the second period last postseason. Most intriguing will be Okposo who is in the final year of his contract. His cap hit is $2.8 million but he’ll earn $4.5 and should draw significant interest next July. The 27-year old Okposo has become Tavares’ side kick. After setting career bests with 27 goals, 42 assists and 69 points in ’13-14, he went 18-33-51 in 60 games with a detached retina forcing him to miss 22 games. He returned and had two goals with a helper in the first round. Considering the talent the Isles possess, Okposo could be traded. Personally, I would try to retain him but the cost could be too rich. Nielsen also is in his last year. With a similar cap hit ($2.75 million), the 31-year old checking pivot will make $3.5 million in what should be his final season with the Islanders. He’s been a dependable player who can play both power play and penalty kill while taking draws. He would be a good addition to any playoff contender depending on where the Isles are next March. The Isles blueline is virtually the same with one exception. Snow brought in Zidlicky to help aid the power play. At this stage, the 38-year old former Devil is best suited in offensive situations. He can man the point and has a good right-handed shot from the point which the Isles can use. 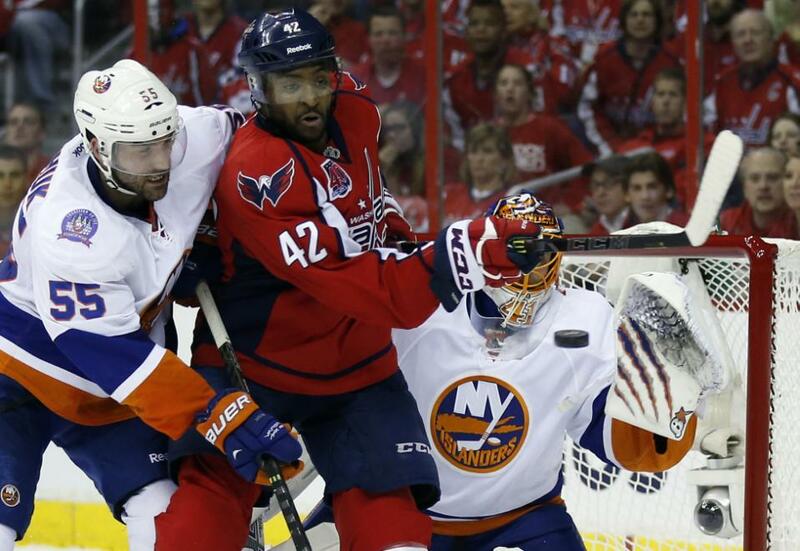 Johnny Boychuk battles Joel Ward in front of Jaroslav Halak. The top four of Boychuk, de Haan, Hamonic and Leddy is solid. Boychuk and Leddy came in and had good first years. Boychuk is the smart, steady two-way type while Leddy is the smooth skating puck moving type. Both contributed offensively with each topping 30 points and combining for 19 goals. Hamonic is probably the club’s best defensive defenseman. A gritty player who will do anything to help the team win, the 24-year old missed the playoffs due to a torn left knee ligament. Had he been healthy, they may have advanced past the first round for the first time since ’93. De Haan also missed the last two games with a left shoulder sprain. Another smart defender, the 23-year old could take the next step in his third year. Without Hamonic and de Haan, Hickey stepped up as did Strait, who starts the season on IR with an “upper body” injury. Jaroslav Halak remains the Isles starter in net and one of the keys to 2015-16. 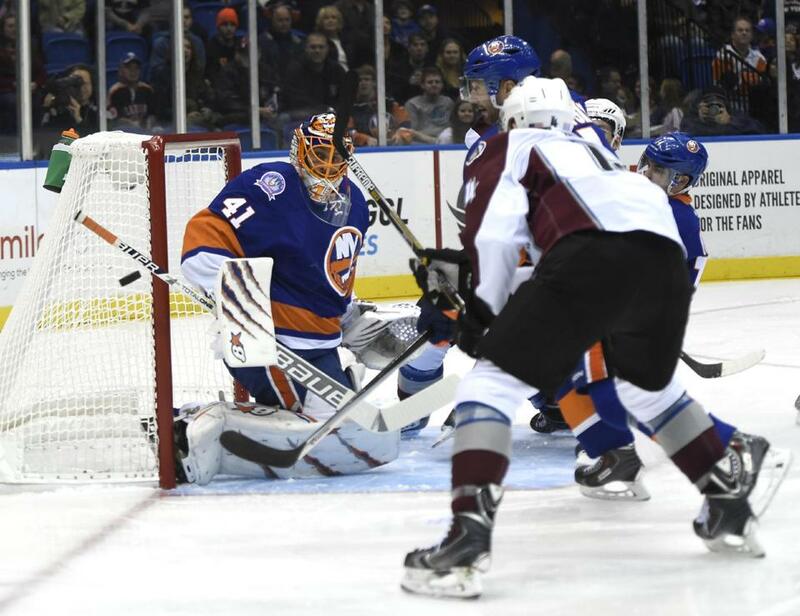 In his first season, Halak set a new franchise mark with 38 wins. But he cooled considerably in the second half probably due to the workload. The 59 games was a new career high surpassing 57 with the Blues in ’10-11. In his first postseason appearance since 2012, he was steady posting a 2.30 goals-against-average and .926 save percentage. He wasn’t the reason the Isles lost. But is still considered the biggest question. Can Halak duplicate the first half of ’14-15 or is he somewhere in between? He won’t be the starter against Chicago due to a “upper body” injury. He’s day-to-day. Greiss replaces Michal Neuvirth as the backup. He’ll get an early cameo with Halak out. The 29-year old isn’t starter material but is capable of filling in. It will basically come down to Halak. If he performs adequately, playoff hockey will come to Brooklyn in 2016. If he doesn’t, maybe Snow deals for a goalie. Jonas Hiller or Jimmy Howard could be available. So could Cam Ward with the Canes former Conn Smythe winner the likeliest target. The Islanders are Tavares’ team. At 25, he is one of the game’s brightest stars. In ’14-15, he set career highs in goals (38), points (86), power play goals (13), power play points (31) and had eight game-winners. It was good enough for a second Hart nomination which went to Carey Price with Alex Ovechkin finishing second. Tavares has been in the postseason twice losing in the first round both times. In 13 games, he has 11 points (5-6-11). The lone highlight being his overtime winner in Game 3 last Spring that put the Isles up 2-1. In a new building, he has a chance to make it a memorable first season. He should hit 40 goals and top 90 points for the first time in his career. There’s plenty of talent. Capuano faces pressure. He made some interesting decisions late in the Caps series benching Lee the final two games and sitting Nelson earlier. Even in a tough Metropolitan Division, expectations are high for the Islanders. Another first round exit won’t be acceptable. This entry was posted in NY Islanders and tagged Anders Lee, Barclays Center, Brock Nelson, Brooklyn, Cal Clutterbuck, Calvin de Haan, Casey Cizikas, Frans Nielsen, Garth Snow, Jack Capuano, Jaroslav Halak, John Tavares, Johnny Boychuk, Josh Bailey, Kyle Okposo, Marek Zidlicky, Matt Martin, Mikhail Grabovski, Nick Leddy, Nikolay Kulemin, NY Islanders, Ryan Strome, Steve Bernier, Thomas Greiss, Travis Hamonic. Bookmark the permalink.